After reading Something Like Hope, it took several days before I could stop thinking about the characters and get my head around the journey I’d taken through each chapter. 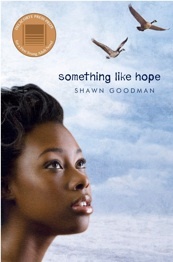 This is an amazing story and I am thrilled that Shawn Goodman agreed to chat about his young adult novel, Something Like Hope. 1. What is Something Like Hope about? It’s the story of Shavonne, a fierce and desperate seventeen year-old who finds herself in a large juvenile lockup hundreds of miles from home. She wants to turn her life around, but her problems seem too big, and time is running out. Amidst corrupt guards, out-of-control girls, and shadows from her past, Shavonne must fight for a redemption she’s not sure she deserves. 2. Was it difficult for you to write this story? It was. At the time, I was working as a psychologist in a girls’ detention center. It was a violent, chaotic place, and I’d leave feeling tired, confused, and generally hopeless. Questions nagged at me. Like, do we really need to lock up children for misdemeanors and status offenses (infractions that aren’t illegal for adults)? Is it possible to do good work in a corrupt system and not be complicit? And if it’s not possible, what should I do? Quit? Fight the system? There were many other questions, and writing the book became a way to try and deal. I’d stay up late, typing, satisfied that at least I’d given voice to some of the struggles I’d witnessed. 3. Why did you write Something Like Hope with an African American Protagonist? I thought it needed to be told from that perspective. I had spent many years listening to tragic stories from girls who appeared to be invisible, without power or voice. Most were African American, and had family histories of abuse, neglect, illiteracy, mental illness, etc. And even though the stories were sad, terribly sad, they contained flashes of insight, strength, and dignity. I wanted to capture this, and to do it accurately required a female African American protagonist. But apart from this formal reasoning, I heard (or imaged hearing) Shavonne’s voice. Other books I’ve written may have started with an idea, an image, or a situation. I say may have because who really knows? But this one, so far as I can tell, started with a voice resonating quite clearly in my head. It was an angry voice, but also intelligent. This last part is very important, I think, because Shavonne’s intelligence is the undeveloped strength that holds the key to her redemption, small though it might be. She can’t really change her past, but she can learn to think differently about it, and that’s how she grows. 4. What were the challenges you encountered in capturing the voice of an African American female teenager? If I can change the challenges to risks, I’d say the first risk is failure. There are so many ways for a writer crossing gender and race to get it wrong. Unbelievable characters. Stilted language. Forced or shallow emotions. Or simply showing to the world through your writing that you don’t know what the hell you’re talking about! The other big risk is of stepping on others’ cultural toes. I think the question that best speaks to this is, “what gives you the right to write this book?” It’s a good question, a fair question, and perhaps the best answer in this case is, “because no one else was going to write that particular book.” The girls I got to know in lockup read everything they could get their hands on. And yet, there were so few books with characters and stories that reflected their experiences. It’s invalidating, if you think about it. Every kid should be able to find books that speak to him/her, books that offer different perspectives. 5. What kind of response have you received from the African American community in response to Something Like Hope? People have been very positive. The most frequent comment has been, “I read it straight through, from beginning to end.” This has been seconded by, “I keep thinking about Shavonne; she reminds me of…” Those are good things for any writer to hear, but I have been especially grateful for the openness of readers and critics to allow a forty-year old white man tell the story of a seventeen-year old African American girl. It would be easy to dismiss the whole thing, and yet…people haven’t. I am grateful for this, because the alternative is to write only within the boundaries of our own racial, cultural, and/or gender identities. Imagine if we could only tell stories about people who look and dress and talk exactly like us? 7. Are you working on another novel? If so, can you tell us about it? My next book is called Kindness for Weakness, and it’s a little bit of Catcher in the Rye meets One Flew Over the Cuckoo’s Nest. It should be out in summer, 2013, with Delacorte. The title actually comes from a line in Something Like Hope, but it’s a very different kind of book. It lacks much of the drama and emotion, yet I think it’s every bit as powerful. Perhaps more. Great interview! Nodded my head in agreement with this: “Every kid should be able to find books that speak to him/her, books that offer different perspectives.” Thank you for sharing your work, Shawn. I appreciate Shawn’s candor. Will definitely have to check out Something Like Hope.